First game was better, but this is still a fantastic game. Where’s my Where’s my Water Spinoffs? Where the hell did Where’s my Mickey and Perry go? Where’s my Mickey was infinitely better than the original, so why did you discontinue it? I wish this game had a “reset” button like the first one does. I hate having to uninstall & reinstall each time I replay it! I’m on at least my 4th time through. Any chance of another sequel? Also, the game needs to be reformatted to have a bit of a border. With the newer iPhones that swipe up from the bottom, it often interferes with game play. I think this is a great app to have when you won’t be having WiFi for a while, which is really convenient. My only suggestion is if you could choose steam or water, just to change things a bit. 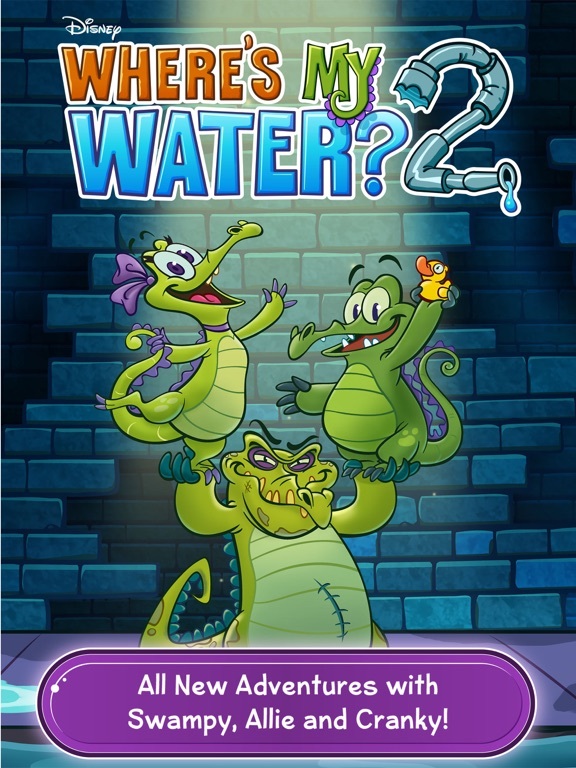 Where is my water 2 is a very fun game a lot more than the first one! Touch input is way off from where your finger touches on iPhone XS Max, needs to be fixed! The first time I tried it I loved this game but now it’s getting a little bit harder for me but I still love this game as much as I love going to my favorite resort called boyne mountain. The game is fun and all. When you can play it... there are so many ads it’s constantly just waiting a minute to click the x. Makes it not even worth opening. You’d think Disney would be better than this. Sensory is way off so it does not drag where you want to drag or swipe. Compatibility view is off when trying to select “next” to move on to next level. I love this game. Personally, the levels are good, and I have no issues with the ads, as you do have to make money. But, the game doesn’t work well anymore. The pause button does not work properly anymore. If I click on it, it won’t let me exit the paused state, and I have to start all over. The ‘choose your duck’ thing is also broken, as I want to click on a duck to choose, but it won’t let me do that, or exit, making me have to restart the app. I love the game, and would probably give it five stars if these problems were fixed. But in its broken state, I can barely do much to pause the level, and can’t exit it, making it only deserving of two stars. I LOVE THIS GAME!!! It’s awesome! But, maybe you could add a power up that gets rid of all the green stuff in a level??? Just a tiny little update but otherwise, great game! Game is amazing and fun. Brings back childhood memories! Why can’t we get rid of ads this is injustice, It’s rig. This game is great and challenges my kids and it is not some junk. I love it. But I don’t like how you can skip to the next level🤯🤯🤯it makes kids not work. Thank you for making this game. Way better then Fortnite. I’ve played this game when I was younger, and I decided to play it again, worst decision ever ! The game kept on freezing on me and wouldn’t let me get past level 2. I wish they would make the game so much better especially as the years have gone by. Yeah, you read right. This is not about Where’s my water, but I know that this game is by the same people. Who took the moronic, retarded decision of discontinuing a great game and leave a less appealing game? I don’t care if Where’s my water was the original, Where’s my Mickey was infinitely better. WHERE’S MY MONEY? Where are my purchases, my freakin’ levels that were so hard to pass? It feels like robbery to me. I read somewhere a half cooked excuse of them dropping a great game to “concentrate on other things”, like... LIKE WHAT? I strongly doubt that deep pocketed Disney have a skeleton crew making and maintaining their games. They have money to create a thousand more, so no excuse that you give me will ever excuse this pathetic act, this nonsensical and cruel decision. If they had even an atom of decency in their bodies, they would at least unlock all of the locked levels and purchase-able stuff so the fans who actually bought this for every-single-system when it came out can still play to the end, even if there’s no support. Not like support was helpful anyway. I am very upset about all of this NONSENSE. I love the game but I entered my age and I’m frustrated. I’m on a really hard level and I have tried over 10 times. What I’m trying to say is the levels are a little hard. Probably because I’m ten but yeah. this game is realy fun and challanging. the only down side is that there is too many ads, it is so annoying. This game is awesome but you haven’t added more levels in years!!! Add more levels. I want where my perry back!!!!! I played perry first and always thought it was better!!! This game is too long and too difficult at times. I get stuck playing where’s my water too often and more often then i did in where’s my perry. Where’s my perry was always more enjoyable overall too. This game is a 2/5 where perry i give an 8/5 (you get my point?) Bring Perry Back!!!!!!!!! Great game surrounded by commercials. I love this game and have been playing it for years. It is a great game to play when u are bored and need something to do. It brings back great memories of being little and I really recommend this game to anyone who is thinking about downloading it. Love it! Fun Game, but really buggy. I bought this game when it first came out. Paid. In. Full. I download it to a new device and now I have freaking ads! What the hell do I have ads on a game I PAID FOR????? I love how it is cool. A good fun challenging game that tricks the mind! I’d suggest this to clever smart people who would take a challenge. It’s a fun game, but there are way too many ads. Would be willing to purchase a full version without ads, but is doesn’t exist. Okay I love the game but when I mess upna level and try to restart the level by pressing the restart button I can never get it to restart and I find myself just clicking and clicking it then having to leave the level go back to the map and find the level I'm on again and I'm doing this at least 9-12 times each level its very frustrating please fix this. This game allows time to pass by very quickly. It also keeps me interested and not annoyed or tired of each level and keeps my brain working! I do hope that there was more of a timeline though. This game keeps my brain thinking and overall active. 5-5 stars! You have to pay to get past level 30. To get past level 30 it says you need 3 keys and you have to buy them or get them from friends on Facebook which I don’t have. If you don’t want to pay to play the whole game don’t get this app. Also you have to purchase keys more then once to get farther in the game. This game needs to be taken off the App Store ASAP! I DEFINITELY LOVE THIS GAME👌👍❤️!!! I tried it myself and I think it is great. One thing though, make the water my flowy if ya get what I mean! This was very fun to have but..the old “Where’s my water?” I found out WHERES CRANKY?!?! So why don’t you make A OTHER ONE that we don’t buy And It HAS CRANKY! I remember paying for the full version a few years ago so I could get all the levels and no ads. I eventually finished the game as it was and deleted the app. Recently I downloaded the game again to relive my childhood. Apparently now the game is absolutely FILLED with ads? Every time you finish a level you have to watch a 30 second ad you can’t skip and you have to watch another when you start the next level. I even checked to see if I had downloaded the lite version by accident, but no, they’ve ruined the full version instead. So I’ve had to delete this amazing game again because it’s virtually unplayable. Thanks, Disney. I mean they ain’t got water and we just flexing on them with this. The games are fun and challenging, but it’s not as straightforward as the original. The ads are very intrusive, too. Ads? In an app I paid for? I’m 50 years old with a scientific PHD. I love this game! The black bar on the bottom of the iPhone X screen affects gameplay. 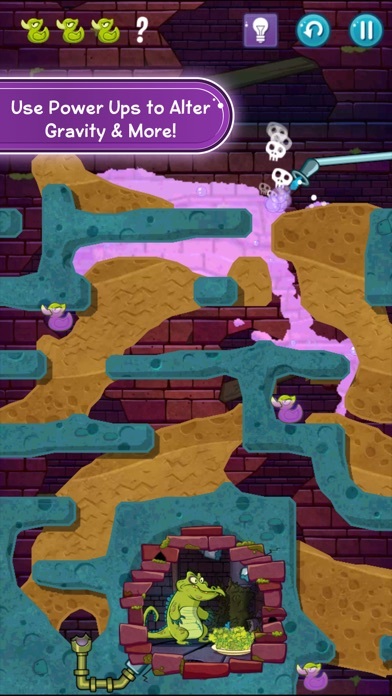 There are several levels that are impossible to play simply because the controls/switches/dirt are at the bottom of the screen. I really like this game with all of the challenges but I also like Where’s my Mickey. It’s not on the device I play on, but it was on my old device. Ok review over 8537548439439438348384/5. Also I can’t get the keys even though I have every single duck. Loved the first one, this one has great additions and stuff but the controls (cutting dirt/holding buttons) feels different. Also cutting back on the ads would be great. My little brother hands my phone back constantly since even if you open/close the app an ad will play. Ridiculous. First one didn’t need to rely on the ads. I would give it five stars but the walls between levels. The ads are so bad! I just got this game and I like it a lot. It challenges you to think about what you need to do. But there is an ad for what feels like every few minutes and it is frustrating! This is game for older kids and you’re not going to keep their attention if there are tons of ads. Please oh please reduce the amount of ads that you show on this game. SO MANY ADS!!! You spend more time watching ads than playing! 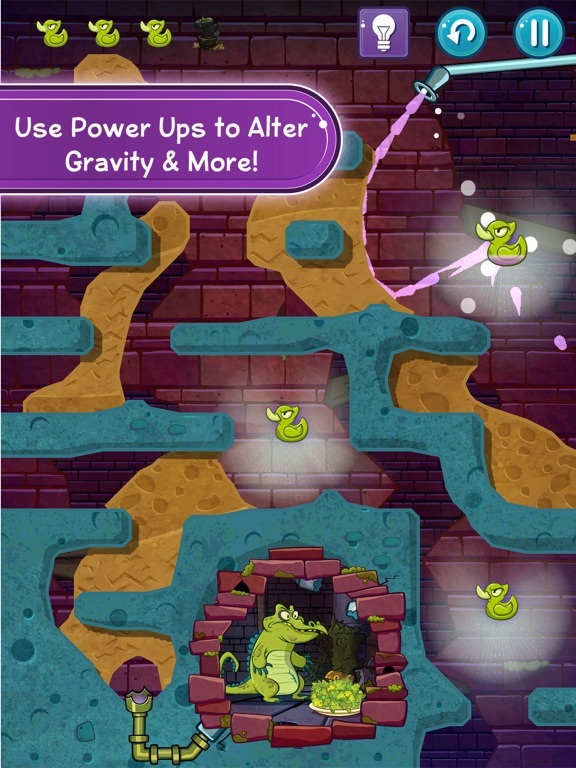 I really love this game because it’s a Disney thing and also has new alligators or crocodiles. only thing that annoys me is the water/gas goes the other direction of where I wanted to go. But still I love this game and I would recommend it. my pastor and i play this game after church on sunday’s. it really has brought us close as we protest about kicking allie off the cast of WMW2 and giving swampy a bigger role. we really hope it goes on to generation to generation and church to church. i look forward to playing and seeing swampy shower. i haven’t met cranky yet but he seems like a pleasant lad i’m excited to see the cast grow up, except for allie. she is the only one i hope doesn’t find water. This has been a great game for me to play to pass time, do when I don’t have WiFi, and let my brothers use. But the controls are so much harder on a smaller screen. This sounds( now that I say it out loud) absolutely ridiculous, but it is very hard to cut through dirt(?) and other things. Please make this easier. Also, in my experience, you have to pay a dollar to get past Soap factory. I don’t know if you can earn the Keys some other way, but that’s how it is for me. I know you need money, but for a smaller child, it’s really not fair. I pretty sure it does this multiple times. Going back to the controls (more like levels), some of them are very hard for a smaller and more young child to pass. I know some of them are optional, but you eventually have to have most all of the ducks you earn to unlock gates. But I do love the fact that you have an avatar duck, but I really wish they would apply to the ducks in the levels as well. That would be so cute and so much more exciting, I guess. The mystery(or magic?) ducks are really cool and a great idea as well. I really enjoy those levels, and hope there are more like them. Please put into thought everything I suggested! I would spend money to not see ads. Even if I choose not to at least when an annoying ad showed up I could tell myself I'm saving a few bucks by watching it. But without that option it feels like I'm a prisoner. I often shut the app right after opening it due to this feeling. Graphics are repetitive and slow. I can't just go to the next level without many clicks and having to wait after each one. Super fun game. It is engaging and complex at every age level! I am really enjoying playing with both of my daughters. This is a fantastic game for both children and adults. It's challenging, entertaining, and fairly easy to play. And unlike other games, you don't have to spend real money in order to purchase cheats or power-ups. You can progress on your own skill. It's an enjoyable way to pass the time on a road trip, a lazy afternoon, or when you just need a break and want something mindless to do. The game does have a few issues. For me, it crashes quite frequently. It's a regular occurrence. The game also has these annoying ads and videos that pop-up at random. I realize that these ads are what gives us all this free content, but they often appear right when you're trying to move from puzzle to puzzle. It's like a kid running right out in the road while you're driving down the street. It's unpredictable and unexpected. What's worse is that the ads will still play sound even when you turn off all the music and sound in the app's settings. I don't mind watching the ads if I have to, but being forced to listen to them when I have my headset plugged in is a bit much. Really needs some iPhone X optimization. In the change log it shows the game being updated for the iPhone X, but actually playing it on one is kinda tough. The first thing is that it seems like all of the interactable objects are in the same location as the home bar on the iPhone X meaning that it’s VERY easy to accidentally “press” the home bar, which forces the game to pause every single time. I’ve had to retry many levels because of this (namely 64). An easy fix would be to move everything in the game “up” so you don’t accidentally press the home bar. Another thing that really bothers me is the ads. I don’t mind watching ads for a free game, but when you get to the final gate of an area, you’re forced to either pay 💰, or watch 3 ads before you’re allowed to transition to the next area. Not only that, but you can only watch one ad per 24 hours. So you are forced to wait 48 JUST to transition between the next level. That is ridiculous to me. 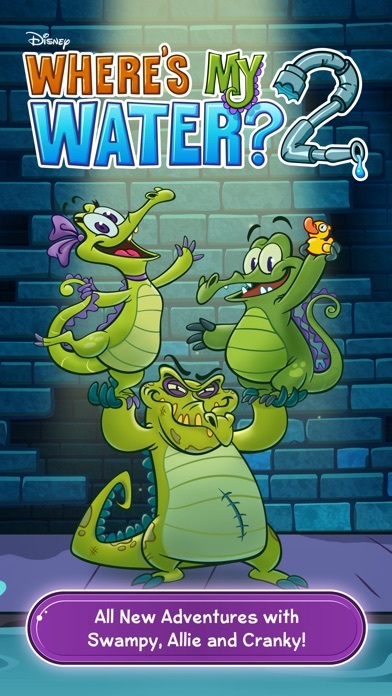 Where is my water is a great game to play for children above 4 years old and also adults. It Has challenging levels and entertaining activities, I recommend this game for people all around the world. The people who created this game must be very smart because this game is fun to play In your car in your house even at a supermarket, because this app can entertain you anywhere. So the app where is my water is awesome I give it five stars and I totally think that the people gave it four stars or three stars or two stars or one star don’t get anything about apps. So that was my review on where’s my water, I hope you enjoyed. I loved the first one. After finishing, I got this game to continue playing. The app closes in the middle of levels. After playing the over and over to finally finish each level, it got to the point where I couldn't do it anymore. I had to stop because I played the exact same level like 10 times in a row. I would get to the end and be so excited that i finished it without it closing... And then I'm back at the home screen again. Nothing gets saved and the only choice I had was to keep doing the same level, or delete the app. So I am deleting. Hope you can eventually resolve the issue because I feel like I would have been able to enjoy it if it didn't crash every 2 minutes. I will be bringing this up at the next shareholders meeting. Absolutely ridiculous. Even if it is a little game, it is embarrassing. Wow, usually I don’t spend the time to write reviews on games, honestly. But this game is so fun and a great time breaker! I haven’t ran into any glitches or ads. I used to have this game a long time ago but then I lost my iPod, but now I’m writing this on my iPad (just got one and I put it in the same spot so I don’t lose it). So I forgot about this app (sadly) but then I was scrolling through recommended apps and I found this. Instantly I remembered this and I installed it. I play it a lot, especially in the car, it’s a great time breaker like I mentioned earlier. I would totally recommend this app, you won’t regret it. Okay this is a very fun game. I love Where’s my Water? And I love Where’s my Water? 2. They are both fun but when I got Where’s my Water? 2 I was having until when I got to the end I noticed I had to have 3 keys to unlock the beach. Normally You would use ducks to unlock levels or chapters. But I realized that If you want to unlock it you would have to Facebook your friends to help you or buy it $1 and I want an easier way to unlock keys! Like make 3 levels that has a key in them and you have to collect them. Thank you for reading my review. This is a fun game. The reasons I give for only three stars are as follows. 1. No way to buy the game that I’ve found so I can turn the adds off. 2. The touch controls for menu items like “restart” and “resume” have to be tapped multiple times in order to get them to respond. It’s not like Disney is short on cash to get a programmer in there to fix such a simple problem. 3. It feels like I’m performing surgery with a machete. Get your finger ready to hit the reset button! Attempting to dig paths on a phone in this game can seem almost impossible. Save yourself pain and misery and play this game on your iPad. This is a fun puzzle game with a solid amount of content. My main gripes are: • The touch controls are very imprecise. Sometimes you need to cut the dirt with quite a bit of precision and the engine makes it feel as if you have giant sausage fingers, leading to lots of reloading and starting over. • I don’t have a problem with the ad implementation (I’m not seeing ads every thirty minutes, perhaps because of the country I’m in? ), but when watching ads to unlock gates, the 24-hour timer is a little ridiculous considering you can’t even start watching them until you’ve unlocked the previous gate. It’s a pretty naked ploy to frustrate people into buying a key. Just let me pay a one-time fee to unlock everything and make the game ad-free and I’d happily pay it, but when you do this I am disinclined to put money into it at all on principle. • The game crashes constantly at the end of levels on my brand new iPad Pro. Please fix this. This game is fun and challenging and offers more than the original, but Where's my Water? 2 always crashes and I have not been able to get past 6 levels because of it. This is really dissappointing because I want to solve these puzzles, but just getting to them is frustrating! I also don't like the energy bar, but I can work around it. Overall, I think I like the original better. If 2 didn't crash all the time, it probably would give me the chance to change my mind. 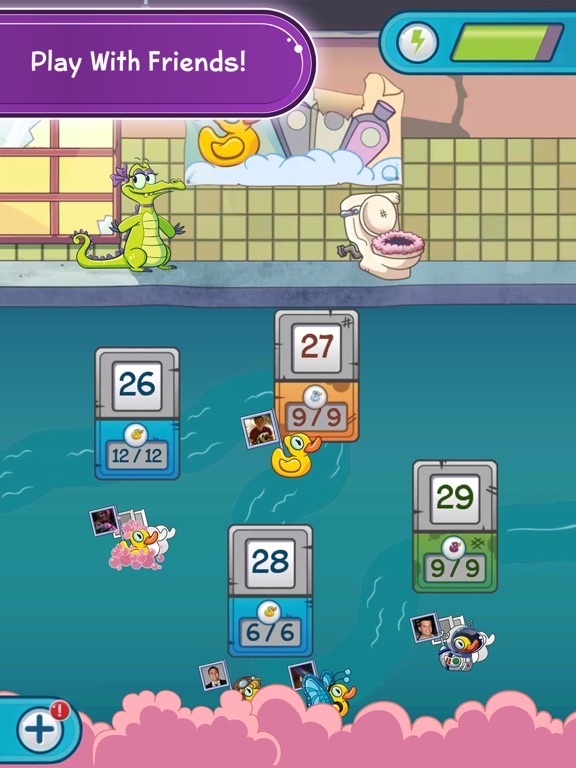 The game is okay but there are too many ads and the game is kinda dumb because you have to get a certain amount of ducks just to go to the next level. It is also kinda boring cause all you are worried about is getting stupid ducks. Sometimes I play it when I am bored and I have nothing else to do though. Sometimes it can be fun though. It isn’t all bad. Some of the ads are okay like the ones for movies but I don’t necessarily enjoy watching them. Overall the game is okay but it needs a little work. While playing the game, I had gotten all 99 stars from the sewers. While I liked this accomplishment, the costume for the duck did not appear. This game still has some glitches to work out considering all of the crash reports. It was a fine game until the last gate of the soap factory. None of the Facebook friends ever play the game or even download it. If this could be changed to either all ducks from the sewer and factory or 3 keys, it would be a better way of playing the game without spending money. This game is the best game of 2018! This game is sooooo fun! It’s almost better than fortnite. It’s not quite as lit as 2k but it’s up there. I’m writing this review because I am currently in class and the is a substitute teacher. Honestly this game gets the whole class hype and honestly lit. Thanks Disney for the lit fricken game. If you loved where’s my water one where’s my water 2 friggin topped it like holy cow! Can’t wait for the third!!! Was 5 stars for the first 30 levels, now this! Come to find out the gate after level 30, which shows a lock and 0/3 needs 3 keys and you have to buy them?!? I’m pretty sure tonight is my last time ever playing this game because I’m going to delete it. 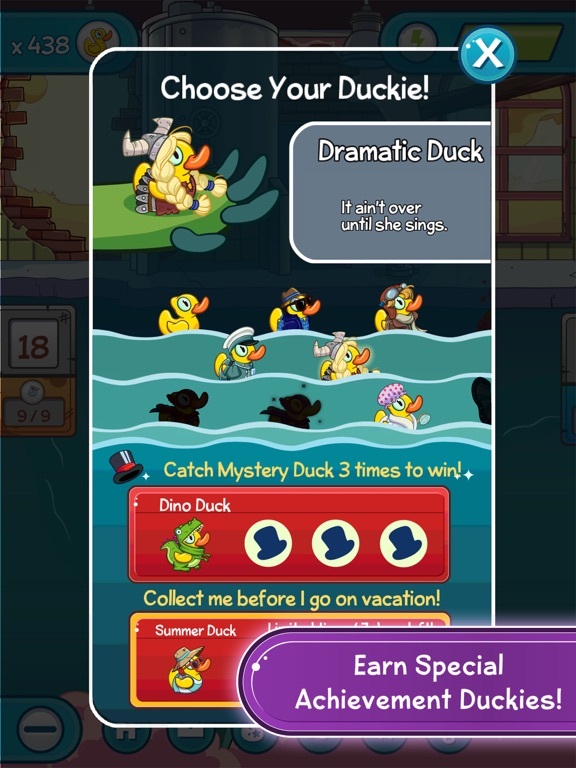 I’ve busted my rump getting literally every duck, musical nite, and mystery duck since I started playing, just to find out there’s no way of getting these 3 keys (granted you can ask your Facebook friends for help, and we all know how much fun that is, but that’s only good for 1 key, you still HAVE TO buy the second and third key no matter what. Gross!! Bye! This is great! 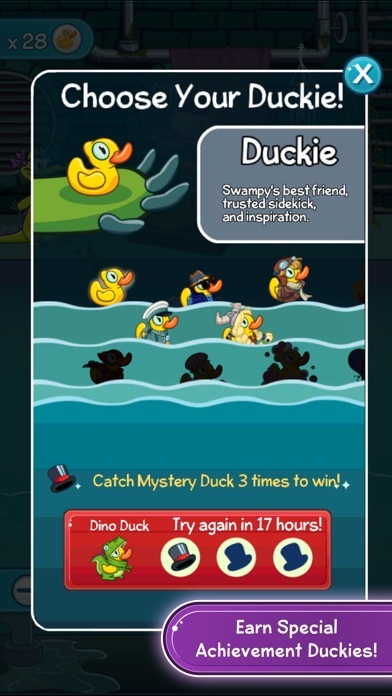 There are so many levels with Swampy, Allie, and Cranky, and you can even customize the little Duckie that swims to the level you're on! 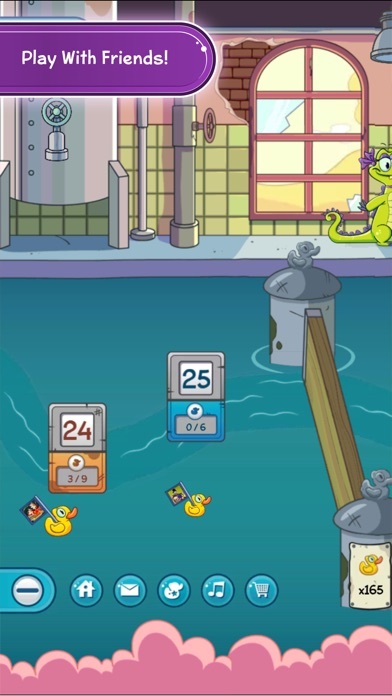 There are several new power ups to get water to the ducks, or steam to the ducks! The only problem is that sometimes the app quits and takes you home so you have to reopen the app and play again. You will be baffled by the cute ducks and water physics. The cute characters just make the game better. As you try to get as many ducks as possible on each level your creative genius will be tried. Then as you make your way through the levels you will laugh at the cute cartoons and funny graphics. Great game all around. Game is fun. Too many ads. This is a solid puzzle-based game. Unlike the original, there is a sufficient amount of levels to play. It works well for either me or my five year old. 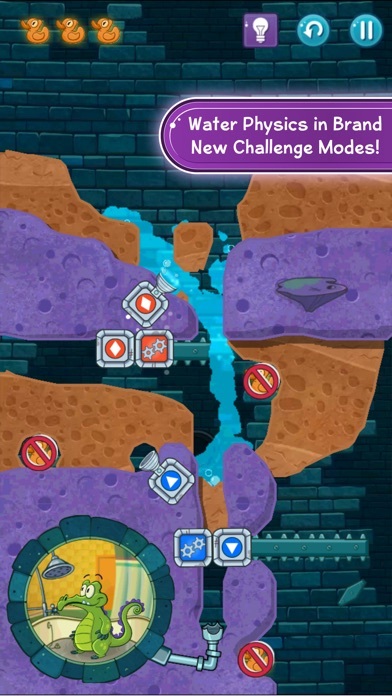 This sequel also offers variations of stages to play, providing different types of challenges. Negatives: Ads are too common, too long, and unpredictable. Current game version crashes VERY often. The game is just enjoyable enough to overcome these frustrations. I never take the time to write reviews but this one deserves it! 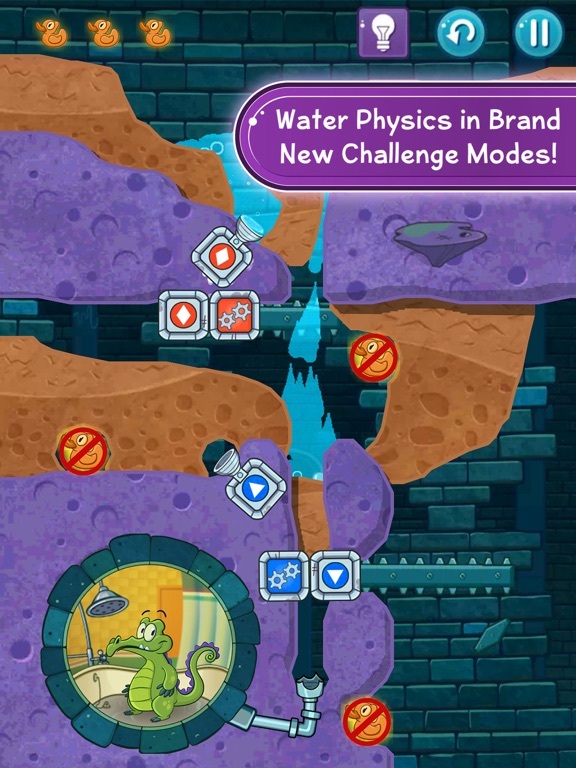 Where’s My Water is fun, challenging and best of all doesn’t bombard me with ads. Also, I don’t have to pay to get additional features. This game has been around for awhile, beginning with the original Where’s My Water. It continues to rate at 5 stars! Game is good, fun yet challenging. But the buttons hardly work if you need to pause, resume or restart. Ads are plentiful, hence why I turned off my data while using the app. Additionally, once you complete the soap factory, you either have to buy the next level to continue on or watch 3 ads once every 24 hours to continue onto the “Beach” levels. If they were to fix those 3 issues this would be a pretty alright game. Haven’t played in a while but I wanted to and every level I pass I have to sit through a 30 second ad. It’s crazy! It also kept asking me to rate the game and I finally hit no (because I previously rated it) and now the game crashes often. So between long ads and the game crashing I can’t stand it! Can I just enjoy a game without watching a commercial? I get enough of it on tv. The game is really well made I played the first one then I saw that there was a second on so I bought it and played it and it was fun until I got to the gate for the beach levels and I had no idea how to get keys but I am still trying to get them and I still play it but will someone please please tell me where to get keys because I am clueless!!! In-app purchases, yes I know. In the case of Where’s My Water 2 this means hitting a long coed gate at level 30 with no way we f passing through without either begging friends for keys or buying a gate pass. No thanks. I won’t pay for gaming. I already watch all your ads. That is payment enough. It’s a nice concept with various levels and challenges but it crashes constantly. Also the resolution is not consistent throughout the game. For example the character with be high res while a lock symbol will be low res. There are also glitches in the game that are not consistent with gravity. For example sometimes a balloon falling down will get “stuck” in the air. I am writing this as I am sitting here waiting for my wife to be done with her doctor's appointment. I needed something to do to make the time go by as fast as possible. This game did not disappoint. The animation is creative, the game is smooth, and the puzzles are fun ! Easy enough to breeze through, but enough challenge for the challenge-seekers, no penalty for starting over (thank cod), AND it recognizes when a crash happens so it can send diagnostic reports so the devs can fix problems. The app is great, but it keeps on crashing and too many ads pop up. It’s kind of annoying that when your brain is working and then and ad pops up, it’s kind of frustrating. It’s okay, but one thing ruins it. When you get to the end of one area, you have to pay money or watch three ads. Not bad, right? Wrong. You can only watch an ad every 24 hours. I’m sorry, but this is a complete dealbreaker. Especially when I’m in a place where I have nothing to do and want to solve some puzzles. Disappointed.